Yesterday, Iran’s Revolutionary Guard announced that it had fired several missiles at ISIS positions in the Deir Az Zor province in Syria. The reason given for this unprecedented military strike was retaliation for double terrorist attacks which struck Tehran two weeks ago. Readers should not underestimate the significance of this event. Make no mistake about it – this was a major media event. It’s been 30 years since Iran has fired missiles at targets outside of its own borders. The following image (above) was released in a media handout from Iranian news agency, Sepahnews, showing a missile launched by the Revolutionary Guard Corps in the west of Iran, targeting an ISIS position near the city of Deir Az Zor. The IRGC has also warned that more missile strikes will follow should ISIS militants plot any future attacks on Iran. “If they carry out a specific action to violate our security, definitely there will be more launches, with intensified strength,” said General Ramazan Sharif of the IRGC (also cited by AP). This latest move by Iran is worrying for a number of reasons. Justified or not, Iran’s launch from its western provinces, over Iraqi airspace and into Syria will most certainly heighten tensions in an already tense Syrian theatre. If the situation escalates, the question of who has the upper hand may not matter should the situation descend into all-out war involving the US. Iran’s missile strike took place on Sunday June 18th, targeting an ISIS command center located near the embattled city of Deir Az Zor, a key choke point on the road to the ISIS-held city Raqqa in northeastern Syria. This area is currently a hive of international military activity featuring a host of players – the Syrian Army, Russia, Iran, Lebanese Hezbollah militia and opposing US, UK, Australia, France, Turkish and German forces positioned alongside numerous US-allied (and paid for) militias like the Kurdish SDF, YPG militias – all presumably camped in the region to “defeat ISIS.” Add to this the problem of US having repeatedly attacked Syrian military forces in a manner which has aided the strategic advances of ISIS. Following from this point, it should be well-known by now, based on successive US aggressions inside Syria, that the Pentagon is probing both Syrian and Russian defenses, testing their level of patience, perhaps in the hope that either Syria or Russia might retaliate against an US aircraft, or US support positions on the ground. In the event that the US loses a single aircraft, or loses one member of its combat team to hands of a Syrian or Russian military asset, then Washington will no doubt seize on this event as an “act of aggression,” initiate its media machine to begin consensus-building internationally, ramping-up military operations on par with Iraq in 2003. This would be the excuse that the US-led Coalition has been needing in order to blow the Syrian theatre open into a wide regional or possibly, world-wide war. The missile strike by Iran could be a mid-term game changer in the sense that it places Iran squarely into the frame of fighting international terrorism, and ISIS. Up until this point, parties in the US led by the Neoconservative right, the Trump White House, and the sister lobbies of Israel and Saudi Arabia – have tried hard to enforce a strict party line that Iran is somehow, “The number one state sponsor of terror on the planet,” despite the fact that no evidence is ever presented to back-up this sensational geopolitical plank. One of the main beneficiaries of this talking point is the Kingdom of Saudi Arabia, who gains on two fronts; the ‘Iranian terror’ line deflects from Saudi’s own sordid role in supporting and funding armed militants, terrorist groups (including active factions in Syria) and radical mosques worldwide. This dovetails well with the Trump Administration’s current embrace of Saudi in the ‘War on Terror’ and the simultaneous casting-out of gulf state Qatar from the US-led Coalition’s inner circle in Middle East military and diplomatic affairs. This week, Turkish troops were deployed to Qatar, in a show of support for the gulf state by Ankara. This is just another signal that the geopolitics of the region and around Syria, is getting more complicated by the day. BFFs? Trump and the Saudis, sword dancing at the Arab Summit in Riyadh last month. However a statement from the Revolutionary Guards linked the “brutal attack” to Donald Trump’s visit last month to Riyadh, where the US president singled out Iran for fuelling “the fires of sectarian conflict and terror”. Despite all of this, Trump has placed all his chips on Saudi Arabia as Washington’s only major Arab partner in the region. Does Washington really think Saudi is of high moral standing in the region? You can blame their decline in popularity for a number of reasons – supporting Wahhabi extremism, beheading Shia clerics, or Saudi’s ability to buy their seat at the head of the UN Human Rights Committee, or cynically acquiring the UN Women’s Rights chair. Perhaps Washington is over-estimating Saudi Arabia’s position as a bona fide leader in the Middle East. Tehran Attack: Who Did It? Another interesting but under-reported component of this story has to do with the reason for Iran’s missile retaliation. Although ISIS apparently claimed credit for the Tehran attacks on June 6th, other evidence suggests that another well-known international terrorist entity might have been involved. The MEK factor is extremely worrying because it signals a new leg in Washington’s asymmetric war in the region. History shows us that when great powers sow this level of chaos, the chances for a multi-country conflagration becomes more likely. Regardless of where blame is apportioned in this case, Iran seems to have accepted the claim by ISIS for these attacks on Iranian soil, effectively giving Tehran an internationally recognized green light to act unilaterally against ISIS assets inside Syria. For those who subscribe to the school of thought that implicates Saudi Arabia and the US for aiding and supporting ISIS covertly, then Iran has not only called their bluff, but co-opted their own ‘anti-ISIS’ narrative too. 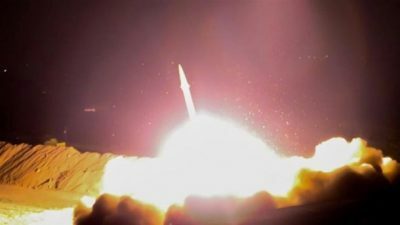 Presently, Iran has military assets deployed in Syria at the invitation of the government in Damascus, so it’s certain that both Damascus and Moscow were aware of Iran’s missile strike in advance, but not the US – once again demonstrating that without significant ground assets deployed in the region the US cannot really control the situation around Raqqa. This means that Washington, no matter how hard its media machine can spin, are simply not able to dictate facts on the ground in Syria. Clearly, Iran seized an advantage here, but how this plays out in terms of increased tensions with the US-led Coalition in Syria remains to be seen. The most worrying aspect of this development is the timing. On the same day as Iran fired missiles into Deir Az Zor province in Syria, a US F/A-18E Super Hornet shot down a Syrian SU-22 fighter jet near Raqqa. Washington claimed it as an act of ‘collective self-defense’ as the Syrian jet had dropped bombs “near US-backed forces.” As a result of this overt act of aggression by the US, the Russian Defense Ministry announced this morning that it is halting its “Deconfliction” cooperation with its US counterparts set out in their bilateral Memorandum on the Prevention of Incidents and Ensuring Air Safety in Syria. Add to this the fact that each day the US continue to kill more Syrian civilians during their supposed ‘anti-ISIS’ strikes in Raqqa, and it’s not difficult to see that the US position is becoming increasingly isolated in the Middle Eastern theatre, leaving its only two remaining solid partners as a pair who themselves are now widely regarded as rogue states in the region: Saudi Arabia and Israel. The scene has now been set for a wider war. All it will take is a small spark between the two major opposing geopolitical forces or their allies. Patrick Henningsen is an American-born writer and global affairs analyst and founder of independent news and analysis site 21st Century Wire and host of the SUNDAY WIRE weekly radio show broadcast globally over the Alternate Current Radio Network (ACR).